We are active in the following viewpoints to Win Customers' Satisfaction and Trust. The Pioneer Group regards ensuring quality as the most fundamental issue in its pursuit of customer satisfaction. Therefore, the Group has formulated its Quality Assurance Philosophy. With the aim of realizing this philosophy, the Group has clarified its quality assurance responsibilities and authority and is working to improve overall quality. Specifically, the Quality Assurance Council has been established, as well as three committees: the Product Safety Committee, the Public Regulations Committee, and the Eco Products Committee. These committees operate across organizations within the Pioneer Group as a whole. Based on its Quality Assurance Philosophy, the Pioneer Group establishes a Pioneer Group Quality Policy for each fiscal year. The policy outlines specific targets for important management items, including product quality, product safety, government regulations, and product environment. Understanding of the policy is promoted among all relevant employees, from development and production to sales and service. Moreover, the Pioneer Group believes that efforts to further boost the promotion of human-centered design, which customers expect from the Group's products, is an essential factor in providing products that fully satisfy customers. In this regard, every effort will be made to reflect this recognition in the Group's product evaluation. The Pioneer Group collects regulatory information from the countries, regions and industries within which it conducts business, along with standardization information from international organizations. This information is disseminated by the Public Regulations Committee, which is organized on a Group-wide basis, and is incorporated in the development and manufacture of products. The Group also ensures through its sales divisions that products comply with national and regional regulations before release. Through these means, the Pioneer Group strives to ensure compliance with public requirements for products and promotional materials. The Pioneer Group has identified basic issues for ensuring the safety of its products, promotional materials, installation work and repairs, and it strives to prevent injury to people and damage to property. To achieve this, a framework centered on the Product Safety Committee has been established, and based on the Action Guide of Product Safety, the Group works on a routine basis to prevent incidents and to respond promptly should they occur. In this context of product safety, information is actively collected from customers, dealers and distributors and collated by the Company's Quality Assurance Division. Reports are then promptly submitted to upper management, and relevant information is fed back to customers, dealers and distributors. The Pioneer Group maintains a structure and system for ensuring product safety during the early stages of new product development. Taking into consideration a broad spectrum of factors, including the needs of users as well as the wide-ranging environments in which products will be used, the Group undertakes risk assessment relating to product safety. In implementing measures aimed at addressing individual risks, the Group is working diligently to prevent the chance of an incident occurring from product shipment through to final disposal. The Pioneer website includes information concerning product safety precautions, with clearly presented visual explanations that allow customers to set up and use Pioneer products safely and correctly. As a part of the overall product development process, the Pioneer Group has formulated a set of proprietary product safety standards that encompasses not only statutory information but also past experience. In adhering strictly to these standards, the Group is endeavoring to deliver enhanced product safety. In addition, the Group has published the Product Safety Manual for product designers and engineers, explaining various vital aspects of product safety as well as other basic concepts. Drawing from resources both within and outside the Group, the manual includes a number of product safety examples. Written in a clearly presented manner, it is used internally as a product safety education and training tool. In the Pioneer Group, information from customers is accurately communicated to relevant divisions for use in sales support and quality improvement activities. For example, at the Customer Support Center in Japan, inquiries and complaints are compiled into a monthly report entitled "The Voice of the Customer," which is distributed to directors, department heads of related divisions and all relevant staff. In addition, the center provides information that can be used for product planning in periodic meetings with business divisions. Similar activities are undertaken at the Group's overseas subsidiaries. In addition to consolidating this sort of regular monthly information exchange, the Group will reinforce its response to issues arising in the marketplace. Information about these issues is conveyed via inquiries to the consultation service, along with repair and service information, analysis of returned products, feedback from Internet surveys, and so on. The Group will promptly feed this information back to its planning and design departments. The product development process consists of a complex interaction of various other processes. The initial (upstream) stage of product development starts with planning conception, which has a significant impact on product quality. The steps required for achieving quality targets are identified at this stage. 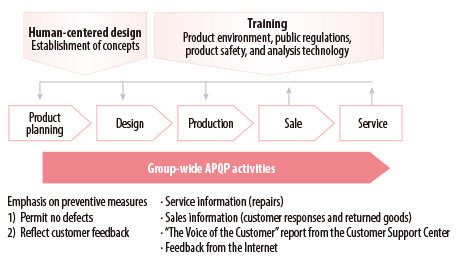 Pioneer uses Advanced Product Quality Planning (APQP), an approach that cuts across various organizations to find and resolve issues quickly. The Pioneer Group will continue to identify best practices in order to maintain and improve total quality across the Group. 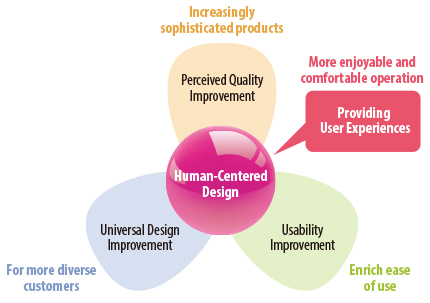 The Pioneer Group promotes Human-Centered Design, which is supported by Perceived Quality, Universal Design, and Ease of Use. The Group is constantly striving to offer a User Experience for customers to enjoy and be pleased to use our products with excitement. Typically human-centered design is a process concept for product development based on the user's perspective, and it conforms to the international standard ISO 13407 for human-centered design processes for interactive systems. ISO 13407 defines the concept, for which there are specific standards concerning usability, Internet accessibility and so on. The Pioneer Group seeks to resolve quality problems in a timely manner, undertaking preventive measures and prompt and appropriate action against the reoccurrence of problems. This is important for providing customers with products and services that win their confidence and satisfaction. Therefore, the Group aims to improve its analysis and evaluation technologies for quality problems caused by materials and components, or issues arising from work practices and the working environment at the site of the development and production processes. Utilizing sophisticated analysis evaluation technologies, the Analysis and Evaluation Center pinpoints the underlying issues and problems that cause defective products by examining market, domestic and overseas Group company, affiliated company and material supplier manufacturing processes. Through an analysis and evaluation of non-defective articles, the center obtains know-how that can be reflected in preventive measures in the development and production processes to increase the long-term reliability of Pioneer products. The Pioneer Group is working to build a framework of the highest quality support and services throughout the world. Each year, the Group conducts a customer satisfaction survey concerning its support and services. The results of each survey are channeled directly toward further improvements in customer satisfaction. In this manner, the Group is endeavoring to expand the circle of Pioneer enthusiasts. The Group consistently makes decisions from the customer's viewpoint, building relationships of trust by providing service that appeals to customers and meeting their expectations around the world. * The above data are results of the customer satisfaction survey conducted by Pioneer. * “Overall satisfaction following repairs as reported by the survey” and “Customer satisfaction with the Parts Ordering Center” are the percentages of respondents who selected “Good” or “Fairly good” from four options (“Good,” “Fairly good,” “Not so good,” “Poor”) for several questions in the postcard/online questionnaire and the questionnaire sheet enclosed with parts, respectively. * “Customer satisfaction with the Customer Support Center” and “Satisfaction with the Repair Desk” are the percentages of respondents who selected “Very satisfied”or “Fairly satisfied” from four options “Very satisfied,”“Fairly satisfied,” “Somewhat dissatisfied,” and “Dissatisfied”) in the survey by automated voice response after completion of response by call center staff. 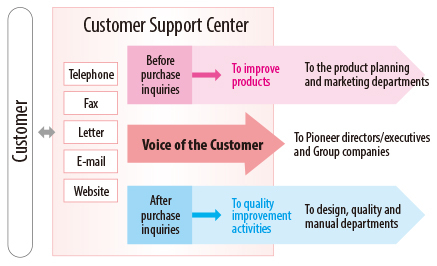 The Customer Support Center in Japan integrates all the support operations for Pioneer products in the country with the aim of providing clear and effective service from the customer's viewpoint. Every year, the center responds to approximately 260,000 before- and after-purchase inquiries by telephone and e-mail. The center does not simply respond to inquiries—it also provides product information from the customer's standpoint and offers value-added proposals in order to provide a higher level of customer satisfaction. In addition, information from customers, including the inquiries and complaints received by customer support departments in Japan and overseas, is accurately communicated to relevant divisions for use in sales support and quality improvements. In fiscal 2018, the Customer Support Center again drew on an evaluation by an external agency to improve the quality of the responses of personnel, including their overall manner, first impressions and friendliness. Pioneer offers its employees training opportunities to experience operations at the Customer Support Center. Listening to customers directly at the center enables employees to develop their own insight and more effectively act based on the customer's point of view. Pioneer handles approximately 116,000 repairs annually in an effort to reassure and satisfy our customers. 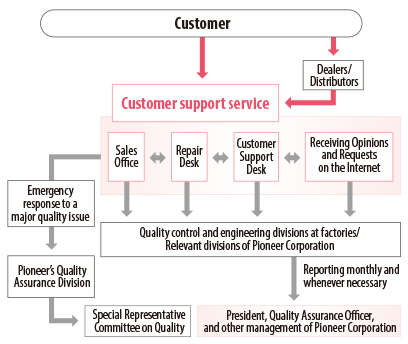 Customers in Japan have praised Pioneer's efforts to respond to their expectations and requirements for improved speed of repairs, as well as for clear explanations from the Repair Desk, the courtesy of responses, and the adequacy of repairs and explanations. In fiscal 2018, the Pioneer Group took steps to strengthen and expand its automotive OEM product service network and systems worldwide. Carrying on from the previous year, every effort was made to bolster and augment the service network and systems that target newly emerging growth markets.